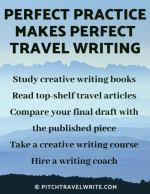 I frequently receive emails from aspiring travel writers asking how I manage to generate so many travel story ideas. I’ve had more than 1,000 articles published in the past ten years. In a good week, I’ve pitched as many as five story ideas, and written up to six articles. “Where do you get so many ideas?” they ask. Genius physicist Stephen Hawking said, “They come into my head while I’m asleep.” I wish I could say something cool like that. But alas, I’m not divinely gifted. I have to work at it. The fact is I’m always looking for new story ideas. I maintain a long list of potential stories in a ring binder and on my computer. I’m always checking travel magazines and newspapers to see what new destinations are surfacing—or being rediscovered. Don’t get the wrong idea. I don’t steal other writer’s stories. I just take the idea and turn it into a new story angle. Take a story about an exciting new destination or tourist attraction that’s popping up regularly in the travel literature. Figure out a slant to this place for one of your regular magazines that you already write for. If you don’t have a suitable outlet, search for more potential magazines to pitch. Some destinations are “evergreen” fodder for freelance travel writers. You’ll notice numerous stories published about them every year. For example, the small town of Leavenworth, Washington is frequently written about. Every aspiring travel writer in the Pacific Northwest wants to write a story about this small town. Here, the restaurants serve all foods German, the Pilsner and Hefeweizen beer are served in enormous steins, and the locals stroll around in Lederhosen, tooting alpine horns. It’s practically a rite of passage for Pacific Northwest writers to “do a Leavenworth piece”. My Leavenworth piece was about several new wine-tasting rooms on the town’s Main Street. It was published in Washington Tasting Room, a wine magazine. Competing editors don’t want to miss out on any tourist hot spots that their rival publications are touting. Look at evergreen destinations in your region. Put a fresh spin on what to see or do and you’ll have a story idea editors will love. One of my favorite destinations has always been the Columbia River Gorge. I’ve made several trips to this magic place and written countless articles about attractions on the Oregon and Washington sides of this magnificent gorge. Many of these stories ideas originated from their DMO press releases and newsletters. Likewise, I enjoy visiting Bellingham, Washington. I also stay updated on their new tourist attractions and events via their monthly newsletters. If you’re particularly keen on one destination and enjoy returning to it, contact its local Destination Marketing Organization (DMO) media rep and ask him or her to send you their monthly newsletter and press updates on new tourist developments. Periodically, I’ll flip through my portfolio of published articles, and brainstorm ways to resell my work. How do I go about reselling my stories? I might resell one of my regional travel stories to a national or international publication, or vice-versa. For example, I wrote a story about Paris’s Pere LaChaise Cemetery, originally published in Emirates in-flight magazine. I resold it to a national U.S. publication called Renaissance. If you can find paying travel websites, consider re-selling your travel stories to them after they’ve finally run their course in print magazines. I resold the Paris Pere LaChaise Cemetery story later to EuropeUpClose.com. Look on The Internet, Duh! The Internet is a potent source of travel story ideas. When I’m planning a trip to a destination and looking for saleable story ideas, I do extensive online research. I look for tourist attractions, tours, museums, resorts, restaurants and spas at the destination. Then I match up the ideas with my regular magazine outlets. 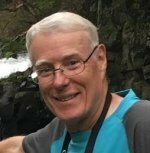 For example, while planning a winter trip to Arizona, I pre-sold a dozen stories to some of my regular outlets and some new outlets, before I even made the trip. Here are a few examples of story ideas that eventuated from that press trip. From my research, I discovered . . .
an enormous military aircraft storage area called “The Boneyard”. I sold this piece to Aviation History magazine. I discovered that Fort Huachuca, in southern Arizona, is the U.S. Army’s Intelligence Center. I sold a story about the Fort’s three communications museums to Popular Communications Magazine. While touring the Titan Missile Museum just outside of Tucson, I noticed several military vehicles on display. I sold that story to a U.K. military vehicles magazine called Military Machines International. From that same Arizona Fam trip, I sold a story about Apache Spirit Ranch, near Tombstone, to GoNomad.com. I sold another story about Tombstone’s silver mining history to Lost Treasure Magazine. I also sold another story about the White Sands Missile Range Museum & Missile Park to a U.K. publication called Space Flight. You get the idea. All these story ideas were derived from Internet research! While I’m doing this research I’m also looking for story ideas that interest me. And I look for story ideas I could pitch to new magazines. I’ve uncovered dozens of travel stories by doing this. 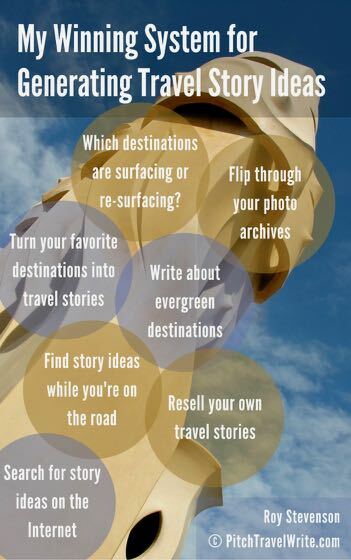 Instead of mindlessly surfing the Internet, put your time to good use and look for story ideas before your next trip. You’ll be amazed at what you uncover. One of my Golden Rules for travel writing is to take photographs of every attraction, no matter how inconsequential they might seem at the time. I’ve often raked up, and sold, new stories from flipping through my photographs after returning from a press trip. I currently have six sets of photographs sitting in my photo archives waiting to be transformed into paid articles. For example, I have photos from several military museums just waiting to become a travel story. Your photo archive is a gold mine waiting to be discovered. My preferred method for drumming up story ideas is to line them up in advance using the above research techniques. Having advance assignments gives you substantial bargaining power when you’re requesting complimentary travel perks. However, always have your “story antennae” up when you’re on your press trip. I’ve never failed to discover lucrative paying articles while I’m at the destination. Sometimes I stumble across unanticipated attractions during my trip. That’s when I swing into action. I conduct interviews and take photographs as if I already have an assignment. Then I pitch the story when I return home. 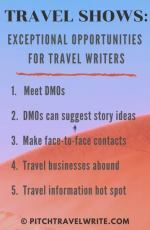 These are my seven favorite techniques for dreaming up travel story ideas. Occasionally a story will fall into my lap, like when a magazine editor contacts me with an assignment. But those are too infrequent to be counted on. Most success comes from sheer hard work. If you want to generate travel story ideas consistently, try these techniques. Research your destinations in advance. Resell your existing stories. Plug in to the DMO community, and scan their newsletters and press releases for ideas. Read travel magazines and websites to see what new and exciting destinations are appearing on the horizon. Use just one of these techniques and you’re sure to see some improvement. Use ALL of these techniques and you’ll have a winning system that generates more travel story ideas than you ever imagined possible.